I don't know if I'm weird, well no, I know that I'm weird, but anyway I have certain phrases that pop into my mind to go with certain actions, or images or sounds that go with certain feelings, like when I feel good I always hear the lapping sound of a rowboat. I've never even been on a rowboat. And whenever I'm trying to scrabble every last crispy bit of fried eggs out of a frying pan I think about God saying to Moses, "for I, the Lord your God, am a jealous God." What. I thought if I wrote it down, it would stop. Despite the distressing ideation that goes with, this is the winner for fall breakfasts at home. I'm super proud when I can get vegetables into breakfast. I don't think of zucchini noodles as a pasta substitute, they don't taste like pasta at all if you ask me. They taste like zucchini, zucchini that you can twirl! Two zucchini may seem like a lot but will shrink down to one serving, so that's two impossible things for breakfast. 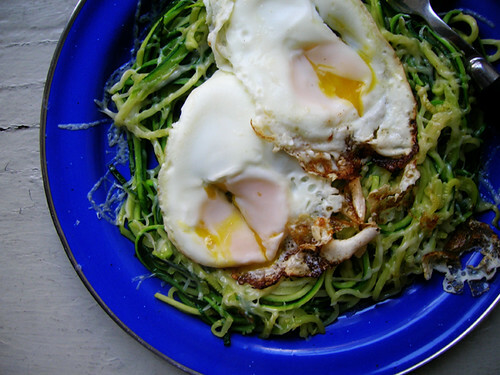 Zucchini loves parmesan, and it also loves soaking up runny egg yolk. Heat oven to 200-300 degrees. Two hundred is probably fine, but my oven doesn't go that low. Wash and trim the zucchini, then julienne them with a julienne peeler or with a knife if you have mad knife skillz or spiralize them with a spiralizer. Saute the zucchini over medium high heat with a pat of butter until the noodles are separate and floppy. Put the zucchini on an ovenproof plate, sprinkle with parmesan, and put the plate in the oven while you fry your eggs. Fry the eggs with a pat of butter also over medium high heat. I crack my eggs in the butter, let them set a bit, then dribble in a little water from the kettle and cover the skillet for a couple minutes; this cooks the tops of the eggs without having to flip them or wait forever. Plate the eggs on top of the zucchini.